The primary bronchus is lined by a ciliated pseudostratified columnar epithelium with goblet cells and mucous glands. The wall of the primary bronchus is supported by cartilaginous plates. The secondary brochus is lined by a ciliated pseudostratified columnar epithelium with goblet cells. Glands and cartilaginous plates are almost completely absent but the muscular layer is better developed. 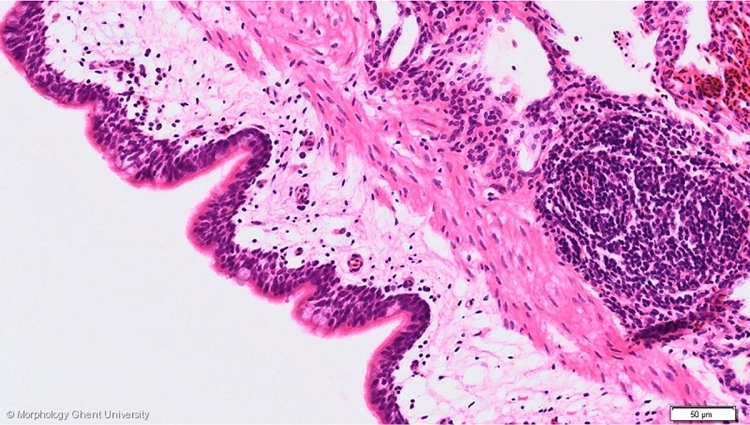 The micrograph above illustrates the wall of a secondary bronchus. Just beneath the muscular layer a lymphatic nodule is present.